Special thanks to LEM Hamburger for extending this food review invitation. LEM Hamburger (乐而美汉堡) is a fast food restaurant near Taman Tambun Indah. This franchise is based in Shanghai and has over 2,300 outlets in China. This outlet at Simpang Ampat marks its first presence in Malaysia. LEM Hamburger is renowned in China for its signature burgers and wraps. The Chinese outlets also serve baozi (包子), but this Malaysian outlet drops baozi in favor of more localized dishes. The food here is pork-free and the restaurant is in the process of applying for halal certification. 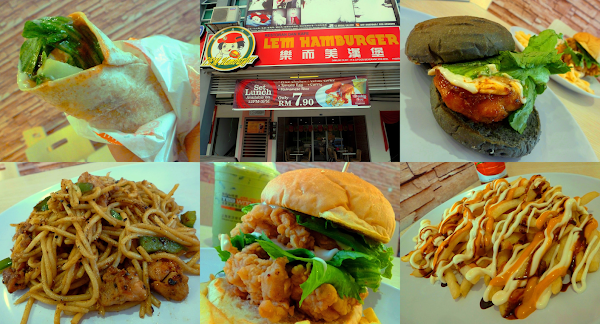 The signature dish of LEM Hamburger is Spicy Chicken Burger (RM7.90). This can be upgraded to a set meat (RM15.00) to include fries and carbonated drink. In addition, an extra patty only costs RM3.00. The patties are deep-fried chicken fillets coated with crispy flour batter. The batter is moderately spicy but I think the name of this burger provides sufficient warning. Meanwhile, the buns are sourced from a local bakery as opposed to frozen ones as used by the master franchisor. Sichuan Sizzling Chicken Burger (RM7.90) is another interesting choice. Sandwiched between two halves of a charcoal bun is a piece of sizzling chicken cutlet. This version is significantly spicier than the previous burger. Fortunately, mayonnaise dressing and lettuce help to round off spiciness to a certain degree. If burgers are too heavy for a meal, try something lighter like Mexico Chicken Roll (RM7.90). Wrapped in flour tortilla are chucks of chicken, lettuce and cucumber, all brought together in sweet salad dressing. The roll has well-balanced taste; I am quite impressed how it is prepared. Don't mind getting your fingers oily? Korean Fried Chicken (RM4.10 per piece) is worthwhile your attention. Using special Korean-style marinade and batter, the chicken is deep-fried until crispy. The chicken is originally coated with sweet sauce when served, but sauce is now provided separately as many customers prefer so. In terms of taste, I think there is still room for improvement when compared to Hana Cafe, but I guess this is acceptable considering the fact that this is not a Korean specialty restaurant. On the other hand, I think the Popcorn Chicken (RM6.00) can use some kind of condiment like barbecue sauce. Also, a light sprinkle of sesame seeds helps too. Nevertheless, I remain satisfied with the crispiness of boneless chicken chunks. Special French Fries (RM6.00) was introduced after noticing that many customers like to drench French fries with lots of sauces. This enhanced version uses mayonnaise and Thousand Island salad dressing. Although I think that the sauces are fine, they have some degree of sourness which not everyone may agree with. Spaghetti Black Pepper Chicken (RM7.90) is made by pan-frying cooked pasta with chicken and green bell peppers. Seasoned with black pepper, the spiciness lingers on the lips and tongue for quite some time. This is a commendable dish that warrants some attention. As for desserts, the H&Q Ice Cream (RM7.50) consists of three scoops of ice cream. Besides a light chocolate drizzle, this dessert also comes with wafer rolls and an Oreo cookie. As for beverages, the Green Tea Latte (RM7.00) is an iced drink made from green tea and milk. Meanwhile, Pineapple Frappe (RM7.00) is a slushy pineapple-flavored drink that is ideal in relieving thirst especially during a hot afternoon. This LEM Hamburger outlet also has barista coffee on its menu. Coffee is prepared using an espresso machine. As per tradition, the cup of Cappuccino (RM6.00) is covered by a thick layer of milk foam. Considering the food quality, serving size and ambience of this place, I think LEM Hamburger has reasonable value for money. The restaurant also provides food delivery within 5 kilometers from the shop. The delivery fee of RM5.00 is waived for orders above RM40.00. Directions: Traveling southbound along North-South Expressway (Lebuhraya Utara-Selatan), take exit 158 towards Bukit Tambun. After the toll plaza, turn left to Jalan Bukit Tambun and drive for over 1 kilometer. After the Caltex gas station, there is a row of shops on the left. LEM Hamburger is one of the shops here, adjacent to Moon Tin Seafood (满天海鲜大饭店). Parking is available in front of the shops.